Get To Know My Perfect Sunday on your Monday morning. 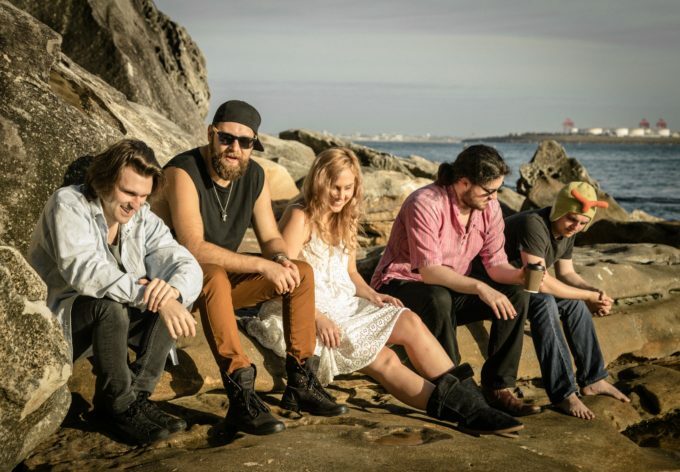 The Sydney five piece have just dropped their rather addictive new single ‘Caffeine, Honey’ and they have grand plans of taking over the charts one step at a time. 01. Band name : My Perfect Sunday. 02. Where are you based? Southern Sydney, NSW. 04. Give us five words to best describe you as a band. Unabashed, unexpected, colourful, theatric, eclectic. 05. What’s your biggest claim to fame so far? Somehow managing to reunite the thought-to-be-dead, late ’80s B-Movie action star Matt Hannon with his cast over the wonders of the Internet for a sequel to the cult classic ‘Samurai Cop’. 06. Who are your members? Ryan Sørensen – Vocals, Guitar, Ryan Agar – Bass, James Ellercamp – Guitar, BVs, Jess Spahr – Violin, Keys, BVs and Brendan Pettit Young – Drums. 07. How was the band formed? We all attended the same high-school which had a really good music program! 08. In what ways has the band changed from when it was formed to today? My Perfect Sunday started off as more of a band format version of the original material I had written. All the songs and parts were written by me, but with the addition of Jess and James it’s definitely more collaborative and for lack of a better phrase, “band-like”. We come up with ideas together and we jam things out and then go away, refine and work on them. 09. Tell us a little bit about your sound. Started off with very stripped back, singer-songwriter based roots, but expanded sonically into more of an experiment in production and extra layers as Jess (violin/backing vox/keys) and James (guitar/backing vox) were added into the fold. 10. What are your members’ favourite songs of all time? That’s an impossible question to answer… ‘Hello’ by Lionel Richie would have to be up there though. 11. What’s your strangest experience as a band? Probably when our guitarist James almost dislocated his jaw putting his fist in it. Why though? We’ll never know. 12. Tell us about your latest release. ‘CAFFEINE, HONEY’ is the first single off our debut EP coming out in February-ish, 2017. It’s a song about wearing yourself thin, glorifying insomnia and obviously, caffeine. It’s kind of a less heavy topic matter song to play live which makes it fun! We also had a lot of fun making the music video. 13. What do your future plans involve? Just really playing more shows and getting our EP out so we can start recording all the cool new ideas we’re working on currently! 14. Where can our audience catch you live? Around Sydney, probably at venues such as Brighton Up, Captain Cook Hotel, Leadbelly, Oxford Art Factory bar, etc. We just did our single launch show and are now looking for some early 2017 dates leading up to the EP release!